Saint Catherine who was canonised in 1461 by Pope Pius II, was born in Siena around 1347. Despite the opposition of her family, who wished her to marry and form a family, she entered the Dominican Order as a Tertiary The saint, who led a life of privation and penitence, dedicated her existence to care of the sick. Among the most frequently depicted episodes in her life are her mystic marriage, her ecstasy and the miracle that took place before the tomb of Saint Agnes for whom Catherine expressed profound devotion. Saint Catherine was a member of the Dominican order, a mystic, and minister to the poor and plague-stricken. A biography of Saint Catherine was written by her confessor, Raymond of Capua. The popular tales about Catherine that derived from Raymond's Legenda are shown here in several panels created by Giovanni di Paolo at the time of her canonization in 1460. In this scene, The Mystic Marriage of Saint Catherine of Siena, Catherine has a vision that she is mystically united with Christ, to whom she extends her right hand. A group of heavenly figures looks on, including, from left to right, Saint John the Baptist, King David, the Virgin Mary, and Saints Dominic, Peter, and Paul. This panel is from the predella of an altarpiece that was in the church of Santa Maria della Scala in Siena. According to the abbot Giovanni Girolamo Carli this ensemble was dismantled and cut up into panels of different sizes for display in different parts of the church in the second half of the 18th century. The eleven panels that comprised the predella have been identified in various museums and private collections. They are: Saint Catherine taking the Habit of the Dominican Order and Saint Catherine and the Beggar in the Cleveland Museum of Art; The Mystic Marriage of Saint Catherine, Saint Catherine exchanging her Heart with that of Christ and The Death of Saint Catherine in various private collections; Saint Catherine receiving the Stigmata, Saint Catherine pleading to Christ to revive her Mother and The Miraculous Communion of Saint Catherine in The Metropolitan Museum of Art, New York; Saint Catherine dictating her Dialogues in the Detroit Institute of Art; and The Crucifixion which is the central scene in the predella, in the Rijksmuseum in Utrecht. Scholars disagree on the relationship between the Pizzicaiuoli altarpiece and the series of ten panels depicting scenes from the life of Saint Catherine. Their arguments fall into three broad categories: 1) the panels were part of the original commission for the altarpiece and were thus painted between 1447 and 1449 [see Refs. Brandi 1941, Coor-Achenbach 1959, and Os 1971]; 2) they were added to the altarpiece after Catherine's canonization in 1461 [see Refs. Pope-Hennessy 1947 and Gore 1965]; 3) they are not related to the Pizzicaiuoli altarpiece at all, but originally surrounded an image of Saint Catherine [see Refs. Pope-Hennessy 1937 and Zeri and Gardner 1980]. These three panels are from a series of ten scenes that originally formed the predella of an altarpiece painted by Giovanni di Paolo for the hospital church of Santa Maria della Scala in Siena. This was among the artist's most important commissions, and the predella, painted soon after Saint Catherine's canonization in 1460, was the first extensive pictorial cycle of her life. A mystic as well as minister to the poor and plague-stricken, Saint Catherine was one of the outstanding figures of the fourteenth century. A biography was written by her confessor, Raymond of Capua, and this work provided the source for Giovanni di Paolo's scenes. In the first scene, The Miraculous Communion of Saint Catherine of Siena, Catherine miraculously receives communion from Christ while her confessor, officiating at another chapel in the church, raises his hand in astonishment at the consecrated wafer, from which a piece has disappeared. In the second, Catherine is mystically united with Christ. Christ's mother presides over the event, and music is provided by the Israelite King David. In the third, Catherine is shown elevated in rapture, holding her heart, which leapt out of her body to be united with Christ's. Among the most notable features of these pictures is the way space is manipulated to underscore the mystical nature of the stories. Two further scenes are in the Metropolitan (Robert Lehman Collection). Saint Catherine (1347-1380) was the daughter of a prosperous Sienese cloth dyer. At the age of six, she saw a vision of Christ and thereafter dedicated herself to chastity, penance, and good works. She became extremely popular in Siena when she selflessly cared for the sick and dying victims of the bubonic plague, known as the Black Death. These two panels were part of the predella (or pedestal) of a large altarpiece painted for the Hospital Church of Siena. The main scene of this altarpiece, showing the Presentation of Christ in the Temple (now preserved in Siena) was ordered by the Pork-butchers Guild (the Pizzicaiuoli) in 1447. The predella was added later when Catherine was canonized in 1461. In the first panel Catherine kneels before an altar and reaches up to choose from the monastic garments offered by Saints Dominic, Augustine, and Francis, all founders of religious orders. Catherine takes the habit of Saint Dominic, which she wore as the founder of the Sisters of Penance. 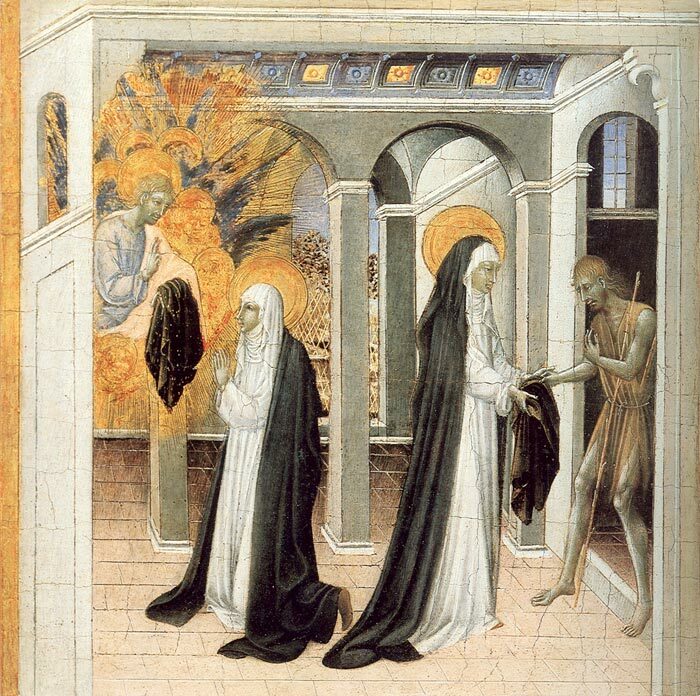 The second panel shows, at the right, Saint Catherine giving her cloak to a threadbare beggar. The beggar was really Christ in disguise, and at the left he returns the cloak to her. For this act of charity, the cloak perpetually protected its wearer from the cold. St. Catherine of Siena and the Beggar, 1460s, Cleveland Museum of Art. Among other stories is that of the visit that she paid to Pope Gregory XI in Avignon during which she persuaded the curia to move back to its traditional residence in Rome Saint Catherine died in Rome in 1380. The central panel of the altarpiece, whose predella contained a complex cycle of the life of the saint according to the abbot Carli was a Presentation in the Temple which has been identified as a panel in the Pinacoteca in Siena The altarpiece was commissioned from Giovanni di Paolo in 1447 by the guild of the Pizzicaioli with the intention that it should be finished in 1449. Giovanni di Paolo located the scene in a precise but expressive interior in which the saint and her companion seem overwhelmed by the setting. This impression is conveyed by their small, slender figures in comparison with the size and presence of the members of the curia. The heads are well conceived and the rich decorative motifs that convey the wealth of the papal court at Avignon do not detract from the composition. Despite the ingenious nature of the composition and its construction, the colours and figures create an elegant scene of great force. Various reconstructions have been undertaken of the altarpiece in Santa Maria della Scala and it has also been debated as to whether this predella, with its scenes of Saint Catherine may or may not have belonged to that work, commissioned in 1447 even though Saint Catherine was not canonised until 1461. Sassetta: The Borgo San Sepolcro Altarpiece, by Machtelt Israels (Editor), James R. Banker (Contributions by), Rachel Billinge (Contributions by), Roberto Bellucci (Contributions by), 2009, Florence & Leiden, Villa I Tatti/ The Harvard University Center for Italian Renaissance Studies/ Primavera Press. Machtelt Israëls is Researcher in the History of Renaissance and Early Modern Art at the University of Amsterdam. Publisher's summary: Sassetta, the subtle genius from Siena, revolutionized Italian painting with an altarpiece for the small Tuscan town of Borgo San Sepolcro in 1437–1444. Originally standing some six yards high, double-sided, with a splendid gilt frame over the main altar of the local Franciscan church, it was the Rolls Royce of early Renaissance painting. But its myriad figures and scenes tempted the collectors of the nineteenth and twentieth centuries, and today its disassembled panels can be found in twelve museums throughout Europe and the United States. This book solves the three-dimensional jigsaw puzzle of this masterwork’s reconstruction and, on a firm scientific foundation, restores it to its vivid historical context. To produce this landmark volume, experts in art and general history, painting technique and conservation, woodworking, architecture, and liturgy have joined forces across the boundaries of eight different nations. Born in Siena probably at the end of the 14th century, Giovanni di Paolo was a painter and illuminator. Although nothing is known of his training it is thought that he may have learned his profession with artists such as Gregorio di Cecco Benedetto di Bindo or Martino di Bartolomeo. He is first mentioned in a document of 1417 relating to a payment for a Book of Hours Giovanni di Paolo’s work, particularly his early output, reveals the influence of late Gothic painting, particularly the Sienese school, with its sinuous lines and interest in decorative elements, which he was able to combine with imaginative brilliance. His work evolved stylistically, partly through his knowledge of the work of artists such as Gentile da Fabriano who lived in Siena from 1426 to 1427, evident in a new emphasis on naturalist details. Clear examples of this evolution are the paintings for the church of San Domenico in Siena (now Pinacoteca Nazionale Siena) of around 1420; The Pecci Polyptych (now divided between the Pinacoteca Nazionale Siena and the parish church of Castelnuovo Berardenga) of 1426; and the Branchini Polyptych (Norton Simon Museum Pasadena) of one year later. In 1441 Giovanni di Paolo was made rector of the Ruolo dei Pittori in Siena while during that decade he collaborated with Sano di Pietro and formulated his mature style. During these years the influence of Sassetta and the new generation of Sienese painters, as well as some elements of Florentine painting, are to be seen in his work. His compositions now reveal a greater monumentality in the forms and a more pronounced sense of three-dimensionality. From this period onwards Giovanni di Paolo created most of his masterpieces and his workshop received numerous commissions. They include the panel of The Creation and Expulsion from Paradise (The Metropolitan Museum of Art New York) while slightly later is a series of ten scenes from the life of Saint Catherine now divided between various collections. His last works were less innovative and reveal a greater degree of workshop intervention. Giovanni di Paolo dictated his will on 29 January 1482 and died in March of that year. Raymond of Capua. Conleth Kearns. ed. The Life of Catherine of Siena. Wilmington: Glazier . 'Catherine Benincasa was born in Siena in about 1347, died in 1380, and was canonized in 1461. She was a member of the Dominican order, a mystic, and minister to the poor and plague-stricken. A biography of Saint Catherine was written by her confessor, Raymond of Capua. In this scene, Catherine is shown elevated in rapture against a background of several churches. She holds out her heart to Christ, who appears above her, his hand raised in blessing. The Museum owns four additional panels from the series: two more in the Department of European Paintings, "The Miraculous Communion of Saint Catherine of Siena" (32.100.95) and "The Mystic Marriage of Saint Catherine of Siena" (1997.117.2), and two in the Robert Lehman Collection, "Saint Catherine of Siena Beseeching Christ to Resuscitate Her Mother" (1975.1.33) and "Saint Catherine of Siena Receiving the Stigmata" (1975.1.34). The other five panels are: "Saint Catherine Invested with the Dominican Habit" and "Saint Catherine and the Beggar" (both Cleveland Museum of Art), "Saint Catherine Dictating Her Dialogues to Raymond of Capua" (Detroit Institute of Arts), "Saint Catherine before a Pope" (Thyssen-Bornemisza Foundation), and "Death of Saint Catherine" (private collection, ex-Minneapolis Institute of Arts). This series is usually associated with an altarpiece commissioned from Giovanni di Paolo by the guild of the Pizzicaiuoli (purveyors of dry goods) in 1447 for the church of the hospital of Santa Maria della Scala in Siena. The central panel of the altarpiece is a "Purification of the Virgin" ["Presentation of Christ in the Temple"] now in the Pinacoteca Nazionale, Siena. Other panels connected with the altarpiece include a "Crucifixion" (Rijksmuseum Het Catharijneconvent, Utrecht, on deposit at the Rijksmuseum, Amsterdam), and pilaster figures representing Saint Galganus and the Blessed Peter of Siena(?) (both Aartbischoppilijk Museum, Utrecht), and the Blessed Andrea Gallerani and the Blessed Ambrogio Sansedoni (both Robert Lehman Collection, MMA). John Pope-Hennessy compares the panels stylistically with Giovanni di Paolo's Pienza altarpiece of 1463, and also calls it unlikely that a cycle of scenes from Catherine's life would be included in a major altarpiece before her canonization in 1461; therefore thinks that the panels were either a later addition to the Pizzicaiuoli altarpiece or were made for a different work. Henk van Os, Reconstructing Sienese of Two Spectacular Examples, in Sassetta: The Borgo San Sepolcro Altarpiece, by Machtelt Israels (Editor), 2009, Florence & Leiden, Villa I Tatti/ The Harvard University Center for Italian Renaissance Studies/ Primavera Press. Van Os refers by way of examples to two altarpieces from this period, one by Taddeo di Bartolo for the church of San Francesco in Perugia, the other by Sassetta for San Francesco in Borgo San Sepolcro. Between 1385 and 1395 Raymond of Capua wrote Legenda. It is traditional hagiography, but in passing it quotes Catherine's conversations with Raymond and others. It also gives us details given nowhere else — for example, about the opposition that Catherine met in Siena — and it reveals Raymond's view of his relationship with Catherine. This panel is from a series of ten scenes from the life of Saint Catherine of Siena. The Museum owns four additional panels from the series: two more in the Department of European Paintings, The Miraculous Communion of Saint Catherine of Siena (32.100.95) and Saint Catherine of Siena Exchanging Her Heart with Christ (1997.117.3), and two in the Robert Lehman Collection, "Saint Catherine of Siena Beseeching Christ to Resuscitate Her Mother" (1975.1.33) and "Saint Catherine of Siena Receiving the Stigmata" (1975.1.34). This series is usually associated with an altarpiece commissioned from Giovanni di Paolo by the guild of the Pizzicaiuoli (purveyors of dry goods) in 1447 for the church of the hospital of Santa Maria della Scala in Siena. The central panel of the altarpiece is a "Purification of the Virgin" ["Presentation of Christ in the Temple"] now in the Pinacoteca Nazionale, Siena. Other panels connected with the altarpiece include a "Crucifixion" (Rijksmuseum Het Catharijneconvent, Utrecht, on deposit at the Rijksmuseum, Amsterdam), and pilaster figures representing Saint Galganus and the Blessed Peter of Siena(?) (both Aartsbischoppilijk Museum, Utrecht), and the Blessed Andrea Gallerani and the Blessed Ambrogio Sansedoni (both Robert Lehman Collection, MMA). Podere Santa Pia is a beautifully renovated holiday house, located in a panoramic position, overlooking the vineyards and beautiful hills of the Maremma. Podere Santa Pia, an ancient small cloister, faces the gentle hills of Maremma Region, offers its guests a breathtaking view over the Tuscan hills. On clear days or evening, one can even see Corsica.